How to Travel in Democratic Republic of Congo? Democratic Republic of Congo is one of the biggest destinations to visit in Africa located in the Central part of the African Continent bordering Uganda, Rwanda, Burundi and Tanzania in the East, Angola and Zambia in the South, Central African Republic in the North, Congo Brazzaville and Gabon in the West. Democratic Republic of Congo is where both Eastern Lowland and Mountain Gorillas are found in its top two major destinations named Virunga National Park and Kahuzi Biega National Park. What’s required in Democratic Republic of Congo? Before traveling to Democratic Republic of Congo, you must apply for the Congo entry visa in advance before your traveling dates such that it’s processed in time, this Visa is processed in a period of one week after your application. This Democratic Republic of Congo tourist Visa costs $100 USD per person and it’s Valid for seven days, if it expires when you are still in Democratic Republic of Congo you have to re – apply. How to Reach Democratic Republic of Congo? Since Democratic Republic of Congo has poor means of transport system its better you land in Rwanda at Kigali airport and transfer from Kigali up to Goma border where you are required to present your Congo entry Visa and yellow fever vaccination card for clearance at the customs, from Goma border you will be transferred by the Virunga safari jeeps up to your hotel of residence or destination of interest but all this is done after booking with Virunga through using a local Tour operator that can arrange your tours in Uganda and thereafter take you to Congo. The operator will handle the submission of your initials like passport details to Virunga and after processing this visa it will be sent back via email to the operator and this operator is responsible of sending you scanned copies of this visa for confirmation but you will be issued your hard copy of this Visa on arrival by this operator, transportation from Kigali to Goma border, booking of accommodation and more. Where to go in Democratic Republic of Congo? 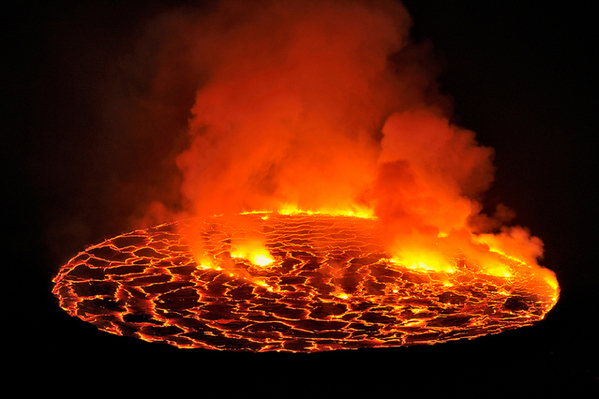 Democratic Republic of Congo has its two major destinations to visit which include Virunga National Park and Kahuzi Biega National Park plus Mountain Nyiragongo Volcano which is its major adventure site to visit. Virunga National Park. This is Democratic Republic of Congo’s top and popular destination mostly visited with interest of seeing the shy endangered Mountain Gorillas, this park is located in the Eastern part of Democratic Republic of Congo bordering Volcanoes National Park of Rwanda. It’s characterized with both tropical rain forest and some parts covered with Bamboo forests, this is the oldest National Park in Africa formerly called Albert National Park, its popularly known for the shy endangered Mountain Gorillas with over six habituated gorilla families for trekking. Mountain Nyiragongo Volcano. This is a popular Volcanic Mountain found in Democratic Republic of Congo inclusive of the Virunga Massif, hiking these volcanoes takes two days and the starting point is in Kibati. The cost for hiking this Volcano goes for $300 USD per person, you are required also to pay for a Mikeno package which goes for $80 USD per person and this package include wearing gears like water proof jackets, food which is cooked while at the top and more, hiking stick costs $5 USD proudly provided by Virunga, porters are also available at $24 USD per person to carry your luggage. Journey to the top of Nyiragongo Volcano. It is usually started in the morning like at 10:00am from Kibati starting point with a guide and security officers to lead you through the journey and you will reach at the top in the evening and this place is really very cold, a night is spent at the top in the reserved shelters to sight the night view of its burning Lava, take photos for memories and more. After that great night at the top next day is for descending back from the top of the Volcano to Kibati starting point for other activities. Kahuzi Biega National Park. This is the next Democratic Republic of Congo’s popular destination mostly known for the Eastern Lowland Gorillas, it’s a protected area near Bukavu town in Eastern part of Democratic Republic of Congo and it’s also near the western bank of Lake Kivu & Rwanda border, it covers about 6000km2 of Area rated to be one of the biggest National Parks in Democratic Republic of Congo. Main activities done in Kahuzi Biega National Park include Lowland Gorilla trekking and Visiting the Lwiro Chimpanzee Sanctuary.